It's always difficult to find an apprtopriate going away gift for an executive or colleague who has been an important part of your team. Our 8.5 x 11 professional presentation portfolio makes the perfect gift for such an occassion. 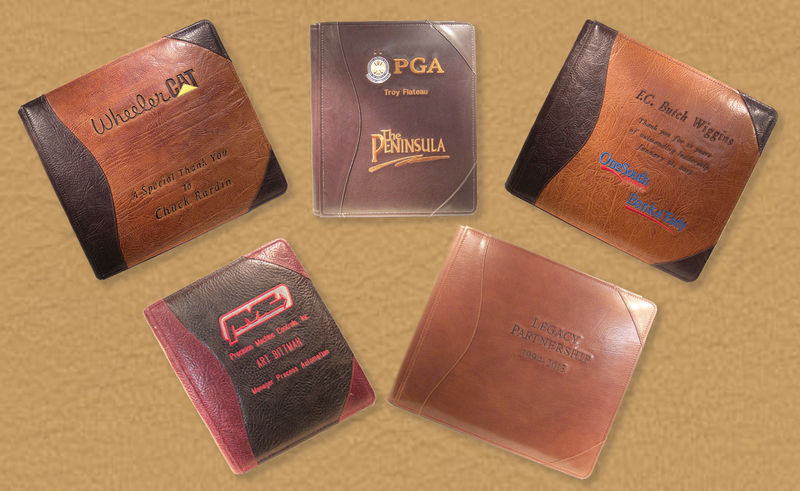 Your leather retirement portfolio will be crafted from the leathers of your choice, and personalized with any name, or company logo that you wish upon the cover leather. The pages are top loading 8.5 x 11 sleeves with heavy black card stock inserts. We regularly receive requests to build personalized portfolios which will be filled with items like letters from co-workers, newspaper clippings, or other nostalgic items which might be associated with persons tenure with an organization or company. We are always willing to work with you to help develop exactly whatever it is that you may have in mind for your order. Please feel free to give us a call anytime to discuss how we might craft a Powell Leather Professional Presentation Portfolio for you.